And, as often happens in such scenarios, greedy bastards have done their best to grab for themselves the tiny slice of profits to be wrung from this cinematic corpse. Despite a fan uncovering the original footage and raising $50,000 to pay for a quality restoration, people related to either the project or its creators are trying to demand payment for the work of others, for a film that would have disappeared forever were it not for the very public domain out of which it’s being pulled. From the director’s son to a woman who appeared in the film (with her father playing The Master) to a random dude hilariously trying to claim ownership of the Manos estate, these people are trying to put a stop to the only reason the film continues to have an afterlife, which is the small-time business of people making their own shirts, posters, and other merch. Joe Warren has attempted, without success, to extract financial payment from numerous parties in the past incorrectly claiming “copyright infringement” on this public domain work…Not only will the release of the film itself in any form become vulnerable, but projects such as the independent sequel Manos Returns, the puppet adaptation Manos: The Hands of Felt, two coloring books, a video game, a memoir, “Growing up With Manos: The Hands Of Fate”, two fiction books, multiple stage productions, and a number of creative fan projects, are now in danger. Warren has tried to argue this is no different than Tolkien’s son getting paid for his father’s famous books, which is absolutely true if you discount every other fact about the situation. 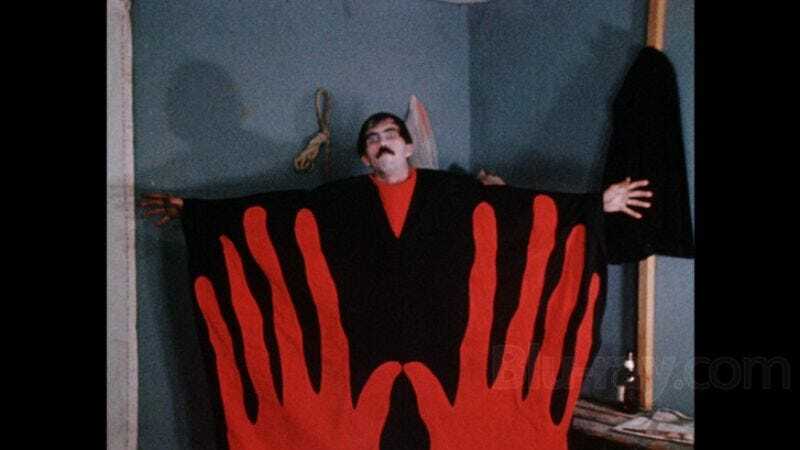 Here’s hoping Manos: The Hands Of Fate will live on in the public domain to inspire countless others to make art inspired by its hypnotic idiocy.